Believe it or not, I actually do quilt almost every single day. Blogging about the work as I go, however, has not been my strong suit. 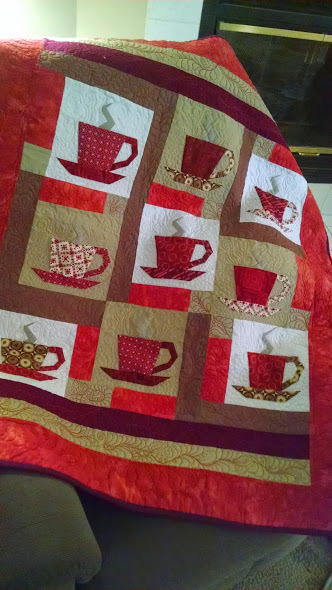 Maybe if I bring this quilt to my PC for coffee breaks, I could write a few lines about what I am working on daily. You may have noticed that I don’t have a lot of interest (or ability, for that matter) when it comes to piecing by a pattern. It is exciting to me to try many different techniques, with the expectation that some trend will develop in my quilts, but thus far that hasn’t happened. That being said, I am currently working on a quilt club “Mystery Quilt” which is involving hundreds of little pieces, which may (or may not) evolve into a neat, precise whole. Also in the works, thanks to Tim Latimer (see timquilts.com) is a redesign of a vintage quilt top rescue. I am still in the process of deconstruction, but have a plan in mind. More on that later this week. The third project in the works, which will also appear in days to come, is a baby quilt, designed in the black, white and bright colors that are of the most interest to infants. 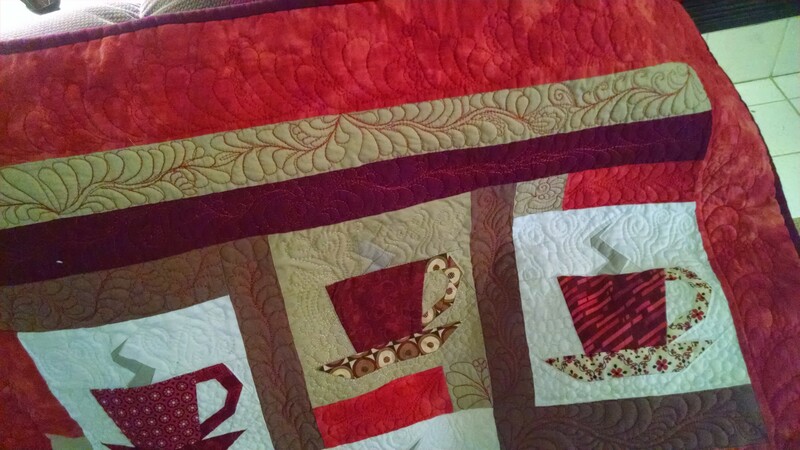 So back to my Coffee Break Quilt. I found a free paper-pieced pattern for the coffee cup on Pinterest, selected colors that make me happy, and surrounded the blocks with those colors in solids, to give me a nice background for machine quilting. The backing is flannel, to make it a nice cozy quilt for actually curling up with a hot beverage. Here’s a close-up, for a better look at the quilting.